Besides the majestic mountains, Nepal is also a cornucopia of multiculturalism. It is a melting pot of diversity in every aspect. The wide expanse of ecosystem that it harbors includes many of the world's endangered species of fauna and floral life. The ever-changing terrain of the country is also a proud feature that presents amazing hamlets, rolling hills, verdant woodlands, arid desert-like landscapes and towering Himalayas all within the relatively small breadth of 193 kilometers from north to south. As such, Nepal is also considered the number one destination for trekking and hiking adventures. Because of the many unique destinations of the country, people from all parts of the world visit Nepal for amazing treks. Here are some of the many reasons why Nepal is the best trekking destination in the world. There is no doubt that Nepal's Himalayas are the most majestic and magnificent in the world. The towering mountain peaks make for a thrilling trekking adventure. The vast expanse of snow and the towering mountain peaks provide a sense of awe and wonder to all trekkers. What's more, the mountain biodiversity of Nepal also contributes significantly to global biodiversity, as Nepal sits at the center of the Himalayan biodiversity hotspot. The mountain regions contain 84 percent of the country’s protected areas. People from all parts of the world visit the country to experience the serenity of the Himalayas. Famous trekking destinations like that of the Annaournas region and the Khumbu present many unique and feature-rich treks. 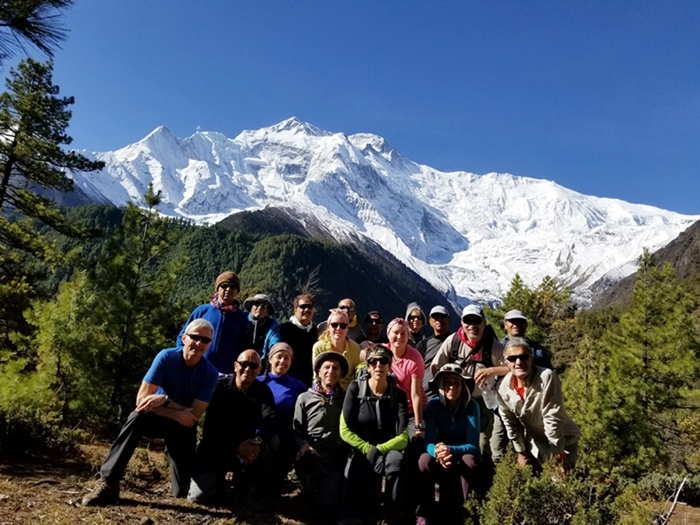 Moreover, the Everest Base Camp Trek- the most popular trekking adventure not only in Nepal, but on the planet, pulls in thousands of enthusiastic trekkers from everywhere every year. One of the major factors people look for while trekking is the beauty of nature. Trekking in itself implies going out and embracing the natural. And Nepal has a lot to offer in this regards. Correspondingly, the elevation of Nepal ranges from around 70 meters above sea level in the eastern alluvial plains to 8,848 meters at Mount Everest. The expanse of the country nurtures unique ecosystems that make trekking a great and beautiful adventure. As matters of fact Nepalese wetlands have great ecological, cultural and economic significance, all of which play into account for a rich and insightful trekking adventure. The rich diversity of plants and animals that exist in wetlands provides a wide range of features and aspects to enjoy for a rich and insightful trekking journey. With the natural ecosystems in Nepal ranging from the tall grasslands, marshlands and tropical and subtropical broadleaf forests in the Terai to temperate conifer forests in the Middle Mountains, Nepal's rich biodiversity directly co-relates to a nature-filled trek through some of the most beautiful and gorgeous land terrains found on Earth. There are mixed and conifer forests in the High Mountains, and alpine meadows above the tree line. All of these ecosystems, and more, are found within the 300 kilometer south-north span of Nepal. Nepal experiences abrupt changes in geomorphology the likes of which is quite fascinating to experience while trekking. Blessed with one of the richest cultural abundance on Earth, trekking in Nepal is always incorporated with witnessing and sometimes participating in the norms and traditional practices of the local ethnic people. At each destination while trekking, one can come across people of different culture with their own traditional practices. This is one of the many main features of Nepal Treks. For example- while trekking in the Annaournas region, one can enjoy the Magar and Gurung cultures in the many villages and settlements lying at the foothills of the Himalayas. Likewise, in the Khumbu, the rich and legendary Sherpa culture is prevalent throughout the region. Similarly, in Mustang, the unsullied Tibetan Buddhism religion and culture can be experienced. Nepal has a very long history, and many remnants of the medieval periods of the country are still preserved to this day. The capital of Nepal- Kathmandu itself is considered as the epicenter of the Himalayan kingdom. From the unique Newa architecture to ancient temples, shrines and monasteries dating back centuries, Nepal presents a very opulent historical and religious disposition. As most of the treks generally start/end in Kathmandu, it is not uncommon to see trekkers enjoying a cultural and religious tour of the city before or after trekking journeys. In the Kathmandu Valley alone, there are seven UNESCO World Heritage Sites located close to one another. That makes Nepal have one of the densest concentrations of World Heritage Sites lying close to one another in the world. In the Kathmandu city, the heritage sites of the holy temple of Pashupatinath, the Bouddhanath Stupa, the Swayambhunath temple, the Kathmandu Durbar Square and the Changunarayan Temple make up the major sites. Outside the city, two other major Durbar Squares (of Patan and Bhaktapur) also offer their own bestowals of Nepali art and architecture. Likewise, Nepal is also the birthplace of Lord Buddha in Lumbini. Besides that, two national parks (of Chitwan and Sagarmatha) are also listed by UNESCO under Natural World Heritage Sites. The amazing woodwork, metallurgy and stone masonry on the doors, windows and pillars of the old monuments and buildings of the sites are phenomenal. The true dexterity of Nepali art and architecture are reflected through the sites and the buildings. Trekking in Nepal is a matter of many different aspects that all blend together to present an experience of a lifetime. From the many vantage points to the daunting Himalayan tapestry to the cultural villages and amazing natural surroundings, trekking in Nepal is definitely worth a visit. Besides, Nepal is also one of the cheaper destinations compared to other South-East Asian countries. It has something for everybody, and people of all ages and experiences can enjoy the many features of Nepal while trekking. It really is the best trekking destination in the world. Thanks for giving great kind of information. So useful and practical for me. Loved your pictures!